We packed up and headed straight for the lodge and one last feast at the breakfast buffet. Stuffed to the gills, we turned our loaded bikes back down the hill and off we went! What had taken most of a day to get up last Friday, now took a short hour or so to descend. Carving the turns as the road snaked down through Red Canyon and through the tunnels was fantastic. All the oxygen in the air was fantastic. All the junk food at the convenience store at the bottom was fantastic. The weather was fantastic. Life was fantastic! Turning north, we followed the left bank of the Sevier River as it fell towards the town of Panguitch. 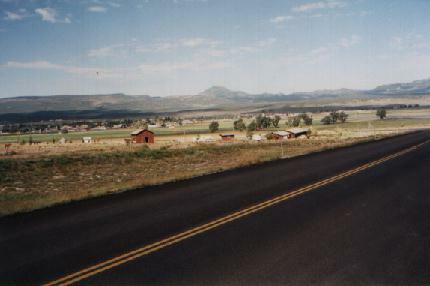 Panguitch lies in a beautiful open valley with mountains to both the west and the east. 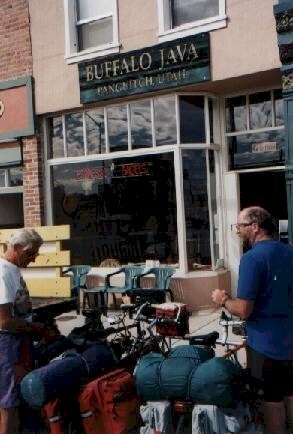 The only business on Main Street with a bike rack out front was "Buffalo Java", so of course we stopped there. With a name like that, I did wonder exactly what they made their coffee out of, but I'll try just about anything once! We saw a number of cyclists from one of the tour groups heading in the opposite direction. Downhill with a tailwind. Wimps! Real tourists ride UP mountains. Real tourists carry all their worldly possessions on their bike. A bit before Panguitch Lake we came to a Forest Service campground nestled along Panguitch Creek. Whew! "So, what do you think? Should we stay here?" The unanimous decision is that we've "gone far enough." After setting up camp, Rick and I amused ourselves by trying to hit the squirrels that were raiding our food sacks with water squirted from our water bottles. Yes folks, this is the kind of spiritually and intellectually uplifting experience that makes cycle-touring worthwhile! Since it was the end of the season and the campground would be closing the next weekend, the campground host told us to help ourselves to all the firewood we wanted. We had a really nice evening sitting around the campfire. What did we talk about? I haven't a clue. But I'm sure it was profound and penetrating.